For trustworthy and efficient automotive locksmiths in Phoenix, you can rely on US Key Service to get you into your car and on your way. Servicing many areas in Phoenix, we provide key replacements, broken key removals, duplications of foreign and domestic keys, replacement of worn out keys, and much more. For fast, and reliable auto locksmiths in Phoenix, trust US Key Service. Contact us today to learn more about our Phoenix auto locksmith services! There is never a good or convenient time to lose your car keys. You could spend hours searching for them, losing time from work or family commitments. You may never even find them, which could set you back even longer. Having a spare set on hand or with a trusted family member or friend can save you a lot of time and aggravation. US Key Service is an experienced car locksmith in Phoenix that can help you get any set of spare keys you need to ensure you don’t find yourself in this unfortunate situation. Our experienced team can make duplicate keys, recreate lost keys, program computer keys and even replace FOBs and keyless entry systems. You can get a set of keys made for any make and model in a short amount of time. When you need a car locksmith near you, trust the professionals at US Key Service to get you on your way. Fast, effective, and trustworthy, US Key Service can take care of your locksmith needs. US Key Service is proud to provide car locksmith services in the Downtown Phoenix area as well as the Historic and Willo districts of 85006, 85004, 85007, and much more. For mobile car locksmiths who operate in Central Phoenix in the Camelback & Arcadia areas of 85018, 85016, 85014, & 85015, the Dreamy Draw area of 85020, & 85028, & the West Phoenix areas of 85021, 85029, & 85051, come to US Key Service! For excellent auto locksmiths in Phoenix, come to US Key Service. We provide car locksmith services for many areas including the Desert Ridge areas of 85050 and 85054, the Deer Valley areas of 85027 and 85024, and the Norterra areas of 85027, 85085, and 85083. A Phoenix mobile automotive locksmith can also make a new set of keys to help you get into your car if you’ve been locked out. You won’t have to be stranded for hours while you get the help you need. Our professional team will be there as quickly as possible and help you get back on the road. US Key Service has been providing dependable results for the Phoenix area for nearly a decade. Our owners have been in the business for nearly four decades. The many years of combined experience that our team shares shows a commitment to professional results and dependable service. Call US Key Service today to get a set of backup keys for your automobile and ensure that you are prepared in case of any emergency. You can avoid the need for a mobile automotive locksmith and save yourself a lot of time and hassle. 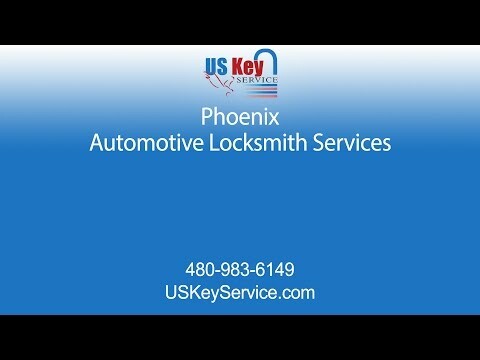 Call the car locksmith that Phoenix trusts, and call US Key Service now!